BomaniteImprint Systems have offeredhomeowners and designprofessionals a virtually limitlesspalette of colors, textures, andpatterns at a fraction of the costof traditional materials. Stain Crete is a deep penetrating concrete stain system that creates beautiful, mottled color tones in existing concrete. Designed for use an old or new concrete in both prestigious commercial projects and intimate residential spaces. Product Description:With enriched industrial experience and acquaintance, we are providing an extensive series of Stamp Concrete. Matching up with the requirements of our clients, we are involved in the offering Stamp Concrete Flooring. It can be applied over any interior or exterior concrete sub-surface, ceramic tiles, marble, granite etc. Stamp Decorating is best suited for Hotel Lobbies, Car Parks and Industrial Flooring. It has excellent bond strength and is suitable for wet area application. 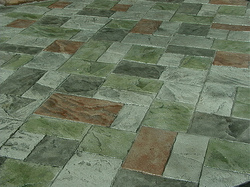 The Stamped Concrete is suitably utilized in industries for producing the decorative outside concrete floor. This Harmony Beton Stamped Concrete is the coating system that is the replica of natural materials like stone, wood, rock, stone with unique realism. This is made from the top grade raw materials in eye-catching designs.